E-commerce is a highly competitive environment and in order to get ahead in the game, businesses need to adopt an effective strategy. Every business, be it online or offline, make strategies aiming to grow in their niche while surpassing previous year’s sales and it’s competitors. That’s what keeps them moving. But what is common in both of these shopping mediums? Customers! They can influence a business’ strategies for both marketing and sales. Whatever a business does, it does for its customers. E-commerce is a wave that has left the brick-and-mortar businesses damp while continuing to surge, even the sales have been rising consistently. So, more and more offline businesses have shifted online. This has lead e-commerce to boom and become a competitive market to experience growth in. For example, in the beginning, there was only eBay, then came Amazon, Alibaba, Walmart, and now, they are competing against each other every second of the day. Amongst these juggernauts, if you have a business that serves the same purpose, how do you plan to grow it? How do you plan to increase its sales and market share? 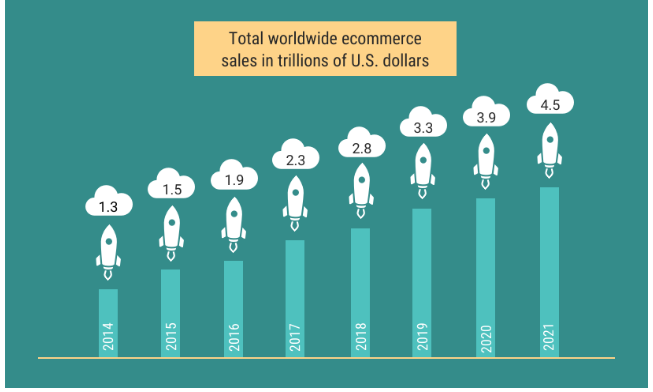 In this article, you will find 3 strategies that will help you experience growth in the competitive field of e-commerce. What is one of the most important element a company needs, to stay in business? Customers. So, you need to give them the value they deserve because customers are the irreplaceable pillar whereupon stands a business’ growth. Don’t make it tumble. How will customers know that a business values them? When you resolve their queries with easy and timely solutions. When they are surprised with discount offers and other benefits like free shipping etc. We all know how anxiously we wait for our order to get delivered, and if it is delivered before the set date then, wouldn’t that just make our day? That is yet another instance when customers understand how valuable they are. It’s because of things like these that a customer begins to trust a brand and ultimately, become loyal to it. If your customers are happy then keep them happy, and you will experience your business growing. And if they are not, you need to make them happy. Why do you need to simplify your website? If a website takes too long to load, what do customers generally do? Shift to its substitute, right? Every person would do that. And this is the last thing a business would want. It needs to be prevented. Still not convinced, here’s another fact that will make sure you are. If your website takes more than 4 seconds to load, the bounce rate rises by 100% and if it crosses 8 seconds then you are facing a 150% bounce rate. Big reasons to worry. We need to reduce the bounce rate. It is because of the rising bounce rate and abandonment of shopping carts that it is necessary to simplify your website and enhance your customer’s shopping experience. The best thing about e-commerce is you can provide a wide variety of options which helps customers decide the perfect product. But having an innumerable variety of your products doesn’t mean that you can clutter them all in one place. This will make the website look untidy and likely confuse customers. The trick is to give them a clean interface. Doing so will assist them in finding what they are looking for. See, how clean and organised it looks? They have showcased their latest product and in the bar above they offer the users with the ease to navigate through the website. So, in your business’ website, showcase the top selling products in a clear and legible way. While shopping online, customers are not able to feel a product, wear it, or clearly understand what it looks like, that’s why they rely on product images. Uploading high quality product images will assist the customer in deciding if they need to buy it or not. If the images are of a good enough quality, the customer will be able to view the product more closely. Next, the product needs to be captured from every angle. This is especially important with clothes as customers will want to view how the garment looks from all angles and will bring them closer to real life shopping. This hoodie available on Amazon.com, shows your how it will look from every angle; they even show you different color variants as well. Amazon has also used a model to give its customers a better idea how it looks when wearing it. And as you move the cursor on the product, the image will enlarge so you can look at every detail. Product description is the next thing that people will look for. For products like books and apparel, the description doesn’t need not be so detailed as the product images will be self-explanatory. But for electronic items such as TVs and smartphones, the decision making process goes beyond the parameters of just the looks. A customer looks at the specification and the special features before finally purchasing. For example. 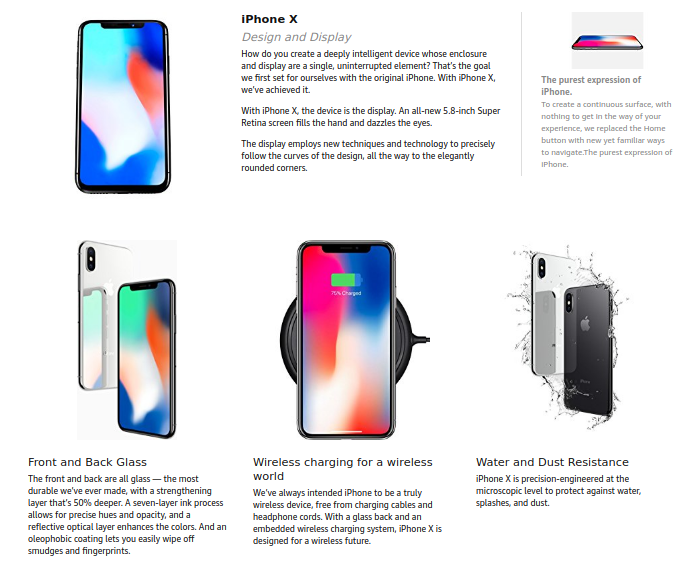 on Amazon.com you will find a detailed product description and a list of special features for the iPhone X. 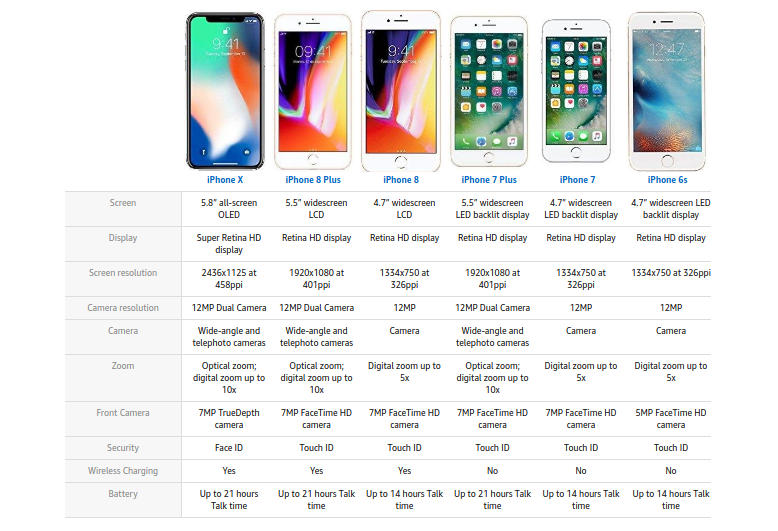 They have even compared the specifications to other iPhones. Including a video alongside the product description and images will also help your customers with their buying decision. 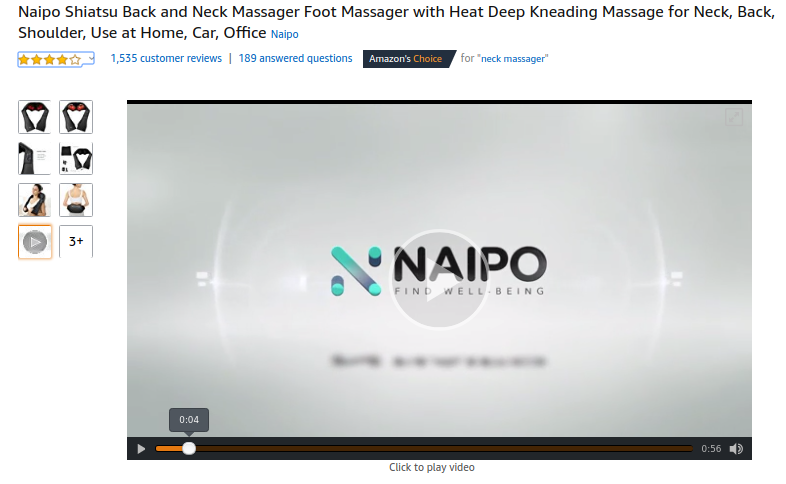 Amazon.com includes a demonstration video alongside images to teach people how to use certain products. After deciding on their purchase, customers look for the shipping policy before moving on to billing. The shipping policy has to be clear with proper terms and conditions, including the delivery charges and time. 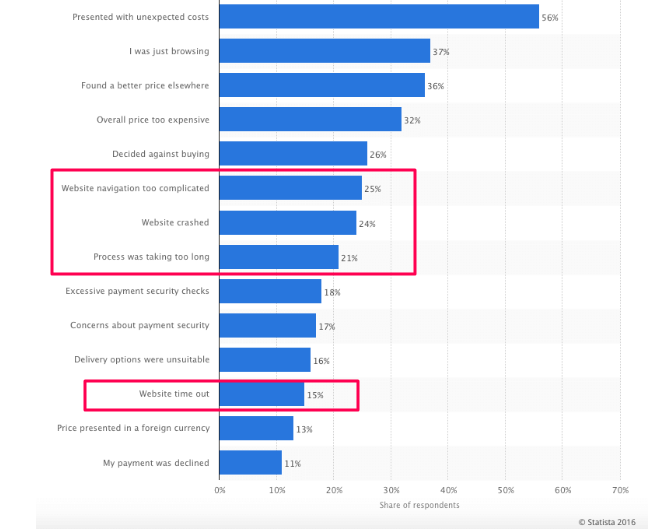 Customers are likely to abandon their cart when unexpected shipping and delivery charges are involved. Keep this process as transparent as possible. When the customer moves to billing, it’s impossible to guess whether they’re going to pay via credit card, debit card, net banking, digital wallet, or PayPal, or what their preferred method is unless they’ve shopped with you before. So, it is highly advisable that e-commerce businesses provide their customers with as many payment options as possible. If the customer complains after the package is delivered because the product is defective, then an e-commerce store needs to have a fool-proof return and replace policy with easy to contact customer service to allow customers to resolve their problem as soon as possible. One reason why you should focus on email marketing is the average time spent reading emails has increased by 7%. Another, much stronger, reason is the R.O.I can be as high a 4,300% for email marketing. You can choose to email people who have been regular buyers and offer them discounts, updates on new products, or a compiled list of their favorite products – based on products they’ve viewed in your store. Alternatively, you could even choose to make a new list to gather new leads. Gathering emails for the second list is not impossible. For example, you could run a contest like a giveaway and appeal to a wider audience. Ecommerce businesses cannot simply grow overnight. You need to keep working on new strategies and keep updating yourselves with the latest trends. You have to set your goals straight and work hard on every tactic that has scope of growing your business. You can always think of new strategies if you base them upon what your customers need: a better shopping experience, better products, and better service. Author: Sahil is the CEO and Founder of Rankwatch - a platform, which helps companies and brands stay ahead with their SEO efforts in the ever growing internet landscape. Sahil likes making creative products that can help in automation of mundane tasks and he can spend endless nights implementing new technologies and ideas. You can connect with him and the Rankwatch team on Facebook or Twitter.